Preamble: We are again pleased to present, with the author’s (@ApathyKills) permission, a new article (originally posted here) from the blog The Unwashed Brain, this time dealing with the horrifying case of the Slavyansk Crucifixion, reported earlier by this publication here and here. We trust that, at this stage, neither the author, nor the subject, need any further introduction. As hereinbefore mentioned, this author’s articles will be a regular occurrence at Slavyangrad.org, so, please, do keep a lookout for more by @ApathyKills. I can’t possibly know if the ‘Slavyansk crucifixion’ story is true or not, and neither can anyone else. Until there’s a proper investigation, the only people claiming confidence of the truth must be either witnesses – or liars. But there’s no sign that there’ll ever be an investigation, and that should worry us. Yes, it’s a lurid allegation – but since when did we refuse to investigate crimes because they sounded too awful? Yes, it’s the word of a single uncorroborated witness – but that’s perfectly acceptable testimony in a court of law. The Slavyansk Crucifixion may be a war atrocity or a shameless libel – but either way it’s a crime and mustn’t be ignored. The only argument against this is that the story has already been debunked online and no further investigation is necessary. But is that really true? That’s what this two-part blog post will try to find out. Quick recap of the story: A ‘separatist’ called Galina Pyshnyak supposedly fled from ‘liberated’ Slavyansk, and was taken in at one of the refugee camps in Russia. On July 11th she was interviewed about her experiences, and claimed to have seen Ukrainian forces crucify the infant son of a militiaman in front of its mother. If this woman is lying, then she’s one hell of an actress. It’s also one hell of a story for propaganda purposes, and journalists from Russia’s Channel One immediately hotfooted it to the refugee camp for a second, more detailed interview. In the centre of the city there is the Lenin square. There is the mayoralty on the one side. This is the only square where all the people can be corralled. On the square, women had gathered – this is because there are no more men left. There are only women and the elderly left. And this is what you call a public execution. They took a child, 3 years old, a little boy. He was wearing little briefs and a t-shirt. They nailed him, like Jesus, to the announcement board. One of them was nailing him, while two others held him fast. And this was all in front of his mother’s eyes. (starting to cry) They were holding the mother, and the mother watched all this happen – how the child was shedding blood, screaming, crying. And then they made cuts [on his body], like this [showing with her hands] – so the child would suffer. It was impossible [to be] there. People were losing consciousness. And then, the mother – after the child suffered an hour and half and died after all of this – they took the mother, tied her, unconscious, to a tank and dragged her around the square three times. And to go around the square once is one kilometre. It’s a devastating story, and it’s natural for the mind to recoil in disbelief. True, Pyshnyak is a compelling witness, and in court I think most jurors would believe her, but that combination of ‘crucifixion’ and ‘child’ smacks of a tailor-made atrocity for purposes of propaganda. It’s been done before. 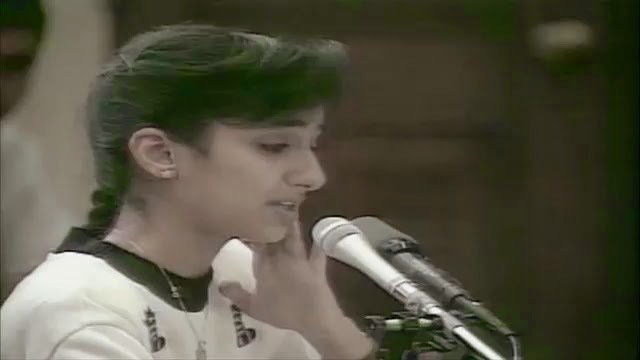 Who can forget the powerfully emotional testimony of 15 year-old nurse ‘Nariyah’ as she whipped up support for the first Gulf War by claiming Iraqi soldiers had thrown sick babies out of their incubators – or that she was subsequently revealed to be the daughter of Kuwait’s ambassador to the US? The ‘Slavyansk Crucifixion’ could be the same kind of thing, and we’re right to regard it with suspicion. But we’d be wrong to dismiss it out of hand. Propaganda’s happened before, but so have real atrocities, and if we think this one’s ‘too unlikely’ we need to remember two things. There is a war on. Western media may like to play down this fact in favour of a ‘crackdown on terrorists’ narrative, but even Human Rights Watch now calls it an ‘internal armed conflict’, and we all know the other word for that. And war changes things. What’s inconceivable in peacetime is terribly common in war, and the atrocities committed by ordinary Americans in both Vietnam and Koreainclude crimes that make the Slavyansk Crucifixion look almost civilized. Before we say confidently that they couldn’t happen now, I’d suggest we ask the people of Iraq and Afghanistan, and the prisoners at Abu Ghraib. This is Ukraine. Evil has nothing to do with race, and there are millions of kind, decent Ukrainians to give the lie to the stereotype of ‘Slavic cruelty’, but there is certainly something in the culture of the Galician area of West Ukraine that puts it apart. Many countries were forced to co-operate with the Nazis in WWII, but only in Ukraine was this participation so enthusiastic and gleeful. Holocaust survivors have repeatedlytestified that the Ukrainian camp guards were even worse than the SS, and as for what Bandera supporters did to Jewish children in Ukraine, I’m afraid it’s too graphicfor me to show here. 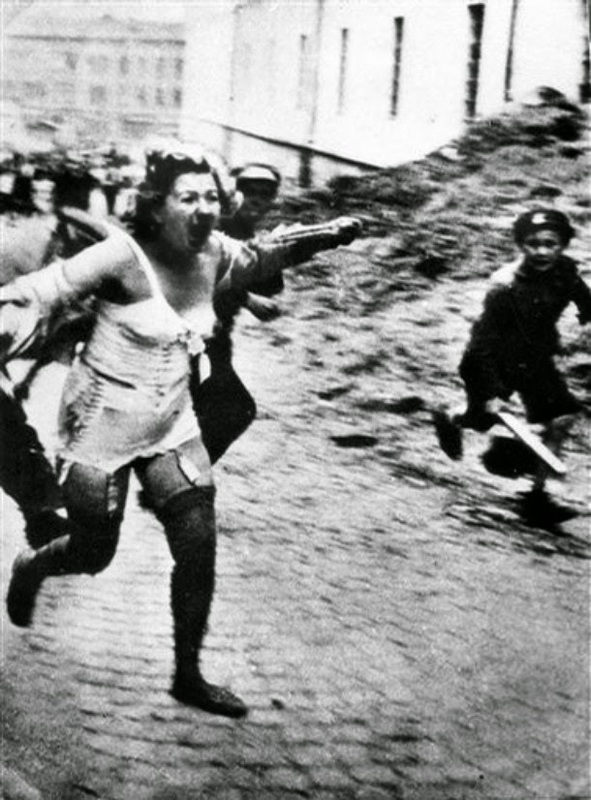 I’m limiting myself to this relatively tame one of an adult in the Lviv massacre, just to give the general idea. Of course this is history, and it would be as wrong to blame modern Ukrainians for it as it is to blame modern Russians for the crimes of Stalin, but there’s a small minority faction in today’s Ukraine who still consider Bandera, Karpenko and Shukshevich to be heroes, and whose actions at Odessa prove them to be worthy successors. Most Ukrainians would be as horrified as we are at the idea of crucifying a child, but those who’ve followed the events of the last few months know the Right Sector are more than capable of it. It’s possible then, and we have to accept that. If we’re going to reject the story of the Slavyansk Crucifixion we need to do it on other grounds. First into the fray is the highly respected Ukrainian journalist and blogger Anatoly Shariy. His short video commentary is in Russian, I’m afraid, but I’ll try to outline the main points below. The strangeness that Pyshnyak knows the child is 3 years old – but seems not to know his name. I’d agree that’s odd, but don’t think it’s fatal. If the story is true then Pyshnyak might well have made a conscious decision to suppress the child’s name, since the father is still fighting in Donetsk and this interview would be the most appalling way for him to learn the fate of his family. The fact that a similar story had already been circulating on Facebook some days before the interview. Shariy summarizes this as follows: ‘Yesterday, the National Guard nailed a little child to an ad board and he hung there until his father, a militiaman, came out, then they shot him dead’ and suggests the story has now been slightly ‘modernized’ for TV. This is an extremely valid point, with several possible explanations. The similarity between the two stories suggests a propaganda creation which it was later decided to support by a real live ‘witness’. The differences suggest it’s a wild rumour, a garbled anecdote passing from mouth to mouth as a kind of ‘urban myth’. A third (and horrible) possibility is that there were actually two separate incidents. It certainly merits further investigation, and we’ll be looking at it in more detail in Part 2 when the full text turns up. The spokeswoman for Ukraine’s interior ministry, Natalya Stativko, on Monday slammed the report as ‘following in the footsteps of Goebbels,’ Nazi Germany’s minister of propaganda. ‘The cruder and the more monstrous the lie, the better it will look for the Russian propaganda machine,’ Stativko said. No facts, no official repudiation, no claim of investigation, just a flat accusation of a Russian lie. It gets us no further at all. The approach may perhaps seem a little immature, but it’s probably the best we can expect from a government whose concept of foreign policy is to jump up and down singing ‘Putin Huilo! La la la la la.’ Kiev obviously knows its own people best, and for many West Ukrainians the argument is now definitively settled – Galina Pyshnyak is a liar. Well, maybe she is, but hidden behind the mud-screen there still emerged one single clear and relevant fact: Galina Pyshnyak is exactly who she says she is, and was indeed living in the Slavyansk area before she fled to Russia. She is in fact a genuine refugee. It’s not much, but it’s a start, and the next analyst to come along gave us a great deal more. This is the very talented Russian photo-journalist Evgeny Feldman, who had his own doubts about the story and visited the square in Slavyansk to see for himself. In this video he pans round the square (thus showing the absence of a ‘bulletin board’) then asks the locals if any of them saw or have heard of the incident Galina described. None have. It seems cut-and-dried, but when we watch this from the comfort of western homes we need to remember this is no ordinary European town. 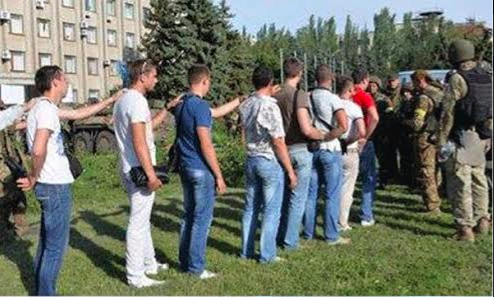 This is Slavyansk. Think about it. The people here have seen their houses destroyed and their friends and neighbours killed in front of them, and now they’ve been left to the mercies of the same Ukrainian army who’s been bombing them. 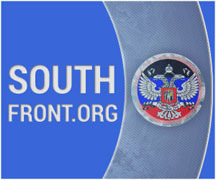 The new authorities have already taken away the young men for questioning, and are (by their own admission) conducting sweeping investigations to find anyone who might in any way have supported the separatist movement. Government leaflets warn of the penalties for assisting ‘terrorists’, and special boxes have even been set up to enable people to inform anonymously against their neighbours. These people are heavily traumatized, and living in a situation of extraordinary tension. 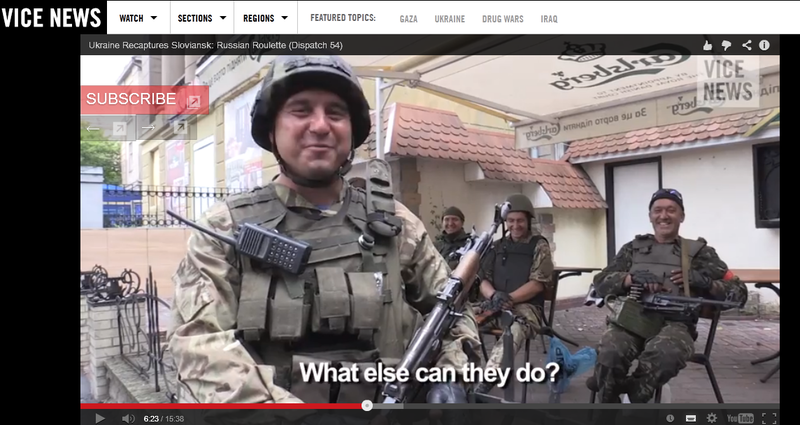 Simon Ostrovsky has managed to capture a feel of it in Dispatch 54 of Vice News’ excellent series ‘Russian Roulette’, especially when he asks the soldiers how the locals react to their presence. The reply (from about 06.10) is chilling. They thank us. They cry and thank us. (Soldiers look at each other and laugh) What else can they do? Look again at Feldman’s video in the light of all this, and it’s impossible not to get a sense of something very wrong. For one thing – where are the men? All these elderly women, but there seem to be only two men on the whole square. Then we remember Galina saying ‘There are only women and the elderly left’ and feel the first chill down the spine. Then the interviews. Many of these women are quite desperate not to be filmed, covering their faces with hands, bags, anything, as they try to shoo the reporter away. Those who do co-operate act as spokesperson for entire groups, saying firmly (without the slightest consultation) that ‘we’ were not there, ‘we’ know nothing, ‘we’ have seen and heard nothing. Look at the body language of the women sitting next to the speakers – the averted faces or hostile stares. Look how many wrap their arms round their bodies in the universal reaction to danger. The sense of fear is palpable. The voluble woman in the blue top is particularly aware of the dangers of saying anything against the authorities – the ‘Russian Roulette’ episode shows her in the square when Simon Ostrovsky witnessed the denouncing of ‘separatists and terrorists’. There were also a lot of men around back then, and it’s hard not to wonder where they all are now. It’s not Feldman’s fault – he’s a normal young man with a normal life and can’t be expected to know the kind of atmosphere into which he’s blundering so cheerfully. But we do know, and can also have a pretty good idea what would happen to these women if they made public accusations against the very soldiers who are occupying their town. Honestly – what do we expect them to say? What would we say in their place? The footage shown here is exactly what we’d expect to see if the story were true. It still proves nothing, of course, but it was when watching this video that I began to feel the first real stirrings of uneasiness. Looking at those faces even made me wonder if there mightn’t be something in this story after all. Maybe I wasn’t the only one, since the tale of the Slavyansk Crucifixion continued to build up steam on social media, and someone somewhere clearly decided it needed serious debunking. Enter America’s tireless Crusader for Truth, Julia Davis. We’ll be looking at what she has to say in Part 2. 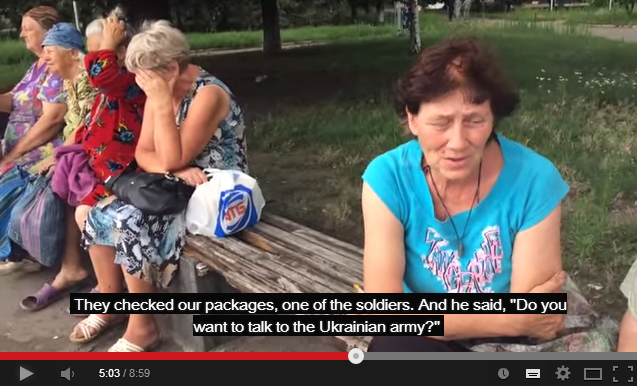 Before anyone dismisses this story, consider that the Ukraine Army is suffering mass desertion. One way to stop that is to use murder and torture to goad the Militia into responding in kind. The backlash will stop the desertions. Understanding why these things are done, makes this lady’s testimony very credible. Anyone in the west who dares tell of some of these attrocities, especially say the public torture of children, will simply be pilloried as believing propaganda. Unless the Militia is very disciplined, such outrages will result in revenge killings, and desertions to formerly friendly Militia will stop. Desertion is the number one problem the Ukraine army has, and this very logical campaign is designed to stop that. Note that since MH17 went down, US SpecOps with Sth American experience have landed in the Ukraine. These tactics are just like those used in South America in the past. Its not new.﻿ This is the famous “CIA school of the Americas” training. When I watched the Feldman video (several times), I was particularly struck by the facial and body language of the elderly woman who appears in the park-bench group around 2:00 minutes in. This is the oldest member of the group, wearing a blue top and red head scarf. She doesn’t say much. But watch her facial expression at the very moment when Feldman starts in with his question about the “crucifiction”. An expression of infinite sadness passes over her face, just for a moment. Coupled with fear. A few seconds later, she reestablishes her “rapport” with the rest of the group by smiling and “agreeing” with their leader that nothing happened. But watch her face and body language. This is a woman in the grip of fear and sadness. And I think Feldman is a callous tool, not to notice how distressed and terrified these people are. To him, it’s all just a game, and he is maybe unwillingly participating in their psychological brutalization. P.S. 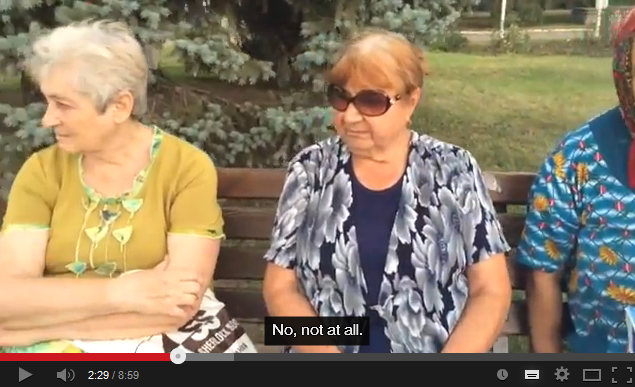 – just to be clear: I am talking about the elderly woman in the blue dress and red head-scarf. When Feldman asks about the “crucifixion”, her eyes and eyebrows bend down, in the universal human symbol of sadness and distress. She even turns her body partly away, and clutches her bag defensively. Also note that not one single person in the video, when asked about the incident, ever says (what I would say if somebody posed such a question to me): “What the hell are you talking about!” Nobody expresses any surprise or shock. Just defensiveness and denial. To me, Feldman’s video is evidence that SOMETHIING REALLY BAD DID HAPPEN THERE. Which was probably not his intention, when he set out to “debunk” Galina’a story. Hang on a minute NZGOV: I think it is possible to over analyse something that is more simple. Think about who on the Ukie side was doing the job of “securing” Slavyansk. Terror from fascists should not be a surprise. All the elements: torture of a small child, and before the eyes of the mother, the religious sacrilege, and then the torture of the mother – all ultimate weapons of psychological terror aimed at instilling fear and absolute compliance on the remaining people in occupied Slavyansk. It seems highly unlikely that the woman reporting this could have invented this scenario. On the other hand that a bunch of psychopathic fascists let loose on their ‘enemy’ inflict terror of this sort does not surprise me. Yes, @sroussina, I agree with you completely. 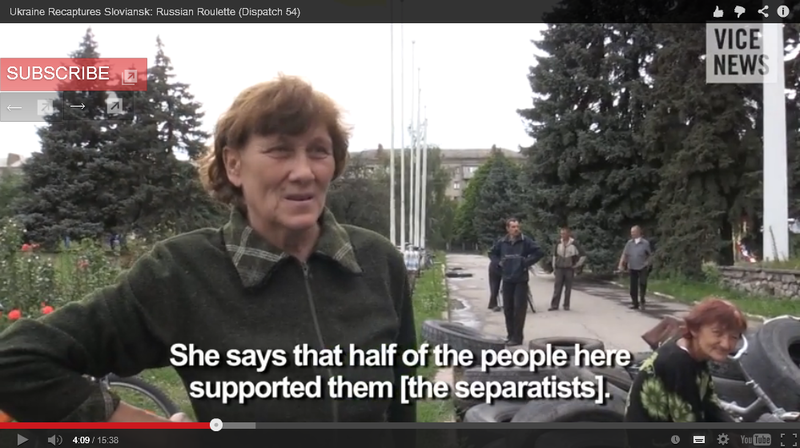 If I remember correctly, National Guard/Right Sector took over Slavyansk to ‘law enforce’ the population. That means: systematic deportation, internment and interrogation of ‘suspects’ at least – we all know the YT clips of the Radical Party Leader and Member of Ukrainian Parliament Oleh LESHKO ‘interrogating’ old men with plastic bags over their heads (at Slavyansk soon after the invasion by the Ukrainian Army) – and asking at Starobelsk the former Police Chief if he should shoot him now or later, waving his pistol in hand – because that’s exactly, what Leshko and the OFFICIAL PARAMILITARY POLICE of the Interior Ministery aka RIGHT SECTOR BATTALIONS are doing: they not only interrogate, they torture – and they kill. Did I hear it right? 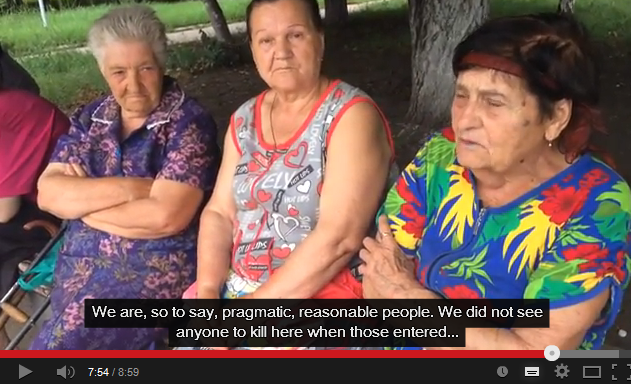 The ‘talkative’ woman at the end of the Feldman ‘report’ is mentioning ‘bodies in some lake’ near Slavjansk, right? Well, maybe Feldman should continue his ‘thorough’ investigation … . 1. the Separatist Militia Fighters of Slavjansk, now fighting with Strelkov in and near Donetsk, are missing their relatives and families who have been left behind since 5.7.2014 late afternoon. No contact possible. Where are those people? 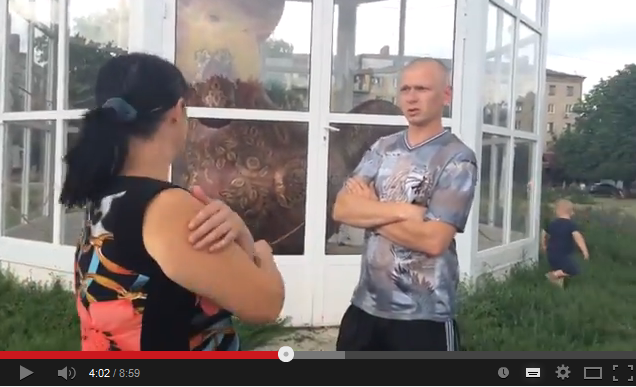 2. where are the bulk of young and older men deported from Slavjansk as ‘terrorist suspects’? 3. there are hints at the construction of Internment Camps for the ‘Unreliable’ at the outskirts of Slavjansk and Kramatorsk – we all know, what that means … . Some days ago there was an attempt of Kiev ‘headlines’ about the torture victims and murder of the Slavjansk Militia. The media talked about ‘mass graves’ with DOZENS of dead bodies as allegedly victims of Strelkov’s policy of terror. (This was spread uncritically on highly respected German newspapers – indicating some serious problems regarding the independence and professionalism of the press …). People commented on those news, that they were inconsistent, illogical and afterall a mere hint at the fast burials of dead FIGHTERS of the Militia, not tortured victims of cruelty. The City Morgue didn’t function well during the shelling of Slavjansk over the months, because of electricity shortcuts. I ask myself: HOW MANY DEAD BODIES COULD BE FOUND NEAR SLAVJANSK – if there were a possibility to investigate as thoroughly as the Right Sector Paramilitary Police ‘interrogates suspects’? And my answer is: THOUSANDS. They use Mobile Crematories for their Army though – so … . Remember, that Poroshenko and soon afterwards Yatseniuk visited ‘Liberated Slavjansk’ – to inspect and instruct. They KNOW WHAT HAPPENED THERE. Maybe they (and others) should be asked at a better time and under the right circumstances. Yes, @Historian, you did hear it correctly that the “talkative woman” mentioned bodies in the lake. She is going out of her way to be agreeable and say the “right” things, but she doesn’t know when to stop talking, and things just slip out of her mouth. Given his presence, and the entire set-up of these interviews, I think we can consider that everybody involved in the making of this tape should be considered a hostage; hence, their “testimony should be taken in the same manner as anyone who gives testimony with a gun held to their head. I agree, @Yalensis, your interpretation of body language and face expressions are all very valid, thanks for that. Yeah, 7:12 definitely a man with very large ears – maybe he is just curious, but I doubt that. The whole piece of video is really producing a general feel of uneasyness and distress. Something is very, very wrong. Well, we can count 1 + 1, right? The last and telling Lady is also delivering very ambivalent messages like ‘we’ re PRAGMATIC AND REASONABLE people, we did not see any cruelties …’ or ‘the Soldiers came into town like LIBERATORS, like ANGELS’ (laughing). Also: ‘… the Army killed us the last two months, why should they do it now?’ I paraphrase her, but that’s, what she is telling – with a clear sarcastic understatement, I suppose. And at the end she hints directly and unmistakenly at DEAD BODIES in the lake. I think, she is as clear about the events as the other ‘talking’ Lady, who remembers the MISSING policemen of her quarter in town, and they go as far as they could in telling the truth. And those eyes have seen lots more than it is adviseable to document on camera. Lots of people are hiding their faces, saying not a single word, just to avoid incoming trouble of the worst kind. You only behave like that, if you’ve experienced the trouble already, directly or indirectly. so here are a couple of points and you may do researches and find much more. Ritual Murder is a particularly ugly and perverted crime. Essentially it involves extreme torture and bloodletting leading to death under religio-magical rites, thus is sometimes called Ceremonial Homicide. This is a universal and multicultural phenomenon, an ancient archetype of evil, occurring in all times and among all races and nations – including the Judaic peoples. Judaic ritual murder is a subject, formerly much debated, but rarely mentioned anymore. The last twentieth century book, written in 1943, was seized and burned after WWII. Nonetheless, the so-called “blood libel” surfaced again in 2001. But even more surprisingly, it made the news in 2007, centering on a Judaic author. Dr. Ariel Toaff, the son of the former Grand Rabbi of Rome, is a professor of medieval and Renaissance history at Israel’s Bar Ilan University, serving as a guest professor in Italy. Early in 2007, he released, in Italian, Pasque di Sangue, Ebrei d’Europa e omicidi rituali or Blood Passovers, European Jews and Ritual Homicides, (Unauthorized English translation, 2007). But under pressure from ADL and other Judaic groups, he withdrew the book “in order to reframe those sections of it misunderstood by readers and mischaracterized in the press”. In further capitulation, Toaff promised to donate any money earned from book sales to the ADL, which had previously condemned the scholar. The famous case of St. Simon of Trent was a central feature of his book. An earlier work reopened this ancient and contentious topic. It was called Blood Ritual: An Investigative Report Examining A Certain Series Of Cultic Murder Cases, released in 2001 under the pseudonym, Philip de Vier. His image was that of an offbeat investigator, somewhat like Inspector Abberline as portrayed by Johnny Depp in From Hell, a 2001 production based on the Jack the Ripper ritual crimes of 1888. In the movie, Abberline bravely pursues all the leads, but dies in the end. De Vier is not dead at all, and I hereby reclaim my other persona. This is one of my pen names. As did Toaff, Blood Ritual deeply explored the 1475 case, affirming its validity. There is a list there of SIMILAR cases over many years that got known. How many never got known?? The author is a highly respected scholar and in the view of many unquestionably thurough and ethical in his researches. There are many other sources in the net for the slow bleeding aspect of JRM. and ALWAYS very young boys.